Europe’s leading platform for digital cooperation between fashion brands and retailers. Be part of the change! Join FASHION CLOUD and shape the future of wholesale with us. Form networks with over 350 brands and 4,000 retailers from 60 different countries. Simplify exchange processes with your partners and make your daily work more effective. Increase your revenues and support your partners. Your solution for direct reorders at the POS. Suppliers allow retailers to see their up-to-date stock availabilities. Our app makes the Endless Aisle easily accessible. With Clara sales assistants are able to reorder out of stock articles while talking to the customer. Your solution for uploading and downloading marketing material, logos and product data. Over 300 brands and 4,000 retailers trust our services. The central pre-order App for retailers. Brands can share their product data via FashionExchange. This is how fast ordering works on a tablet: Complete overview of orders, products and budgets. Your solution for uploading and downloading marketing material, logos and product images. Over 350 brands and 4,000 dealers use our Content Platform. Your solution for direct in-store reordering. Retailers can now track stock availabilities of suppliers in real time. Our app makes the Endless Aisle easily accessible. With Clara sales assistants can reorder out of stock articles directly at the POS while talking to the customer. FASHION CLOUD is an important support in the fashion industry when facing digitalisation. The BTE (Federal Association of the German Textile Retail) calls on the suppliers to provide their photo material via this interface. BTE – Bundesverband des Deutschen Textileinzelhandels e.V. The main benefit we have seen from FASHION CLOUD is saving us huge marketing resources in time and money. The quick distribution of our marketing materials and product data on the one platform means our marketing team spends fewer resources on organizing and distributing our material to our many retailers individually. Integrating our ERP system with FASHION CLOUD has significantly improved our internal processes. We are now able to see more product information as well as product photos from our ERP system which gives us much better insight into our own stock. Become part of the change! Join FASHION CLOUD and shape the future of wholesale with us. Simplify the exchange process with your partners and make your daily work more effective. Deine Lösung für die direkte Nachbestellung im Laden. Lieferanten gewähren Händlern Einsicht in aktuelle Lieferverfügbarkeiten. Unsere App macht das Endlosregal einfach zugänglich. Mit Clara kannst du Wunschartikel des Kunden direkt im Verkaufsgespräch nachbestellen. Deine Lösung für den Up- und Download von Marketingmaterial, Logos und Produktbildern. Über 300 Brands und 4.000 Händler gehören bereits dazu. Die zentrale Vororder App für Händler. Über FashionExchange teilen Brands ihren Produktkatalog. So schnell geht die Order über das Tablet: ein vollständiger Überblick über Bestellungen, Produkte und Budgets. Your solution for uploading and downloading marketing material, logos and product images. Over 300 brands and 4,000 retailers use our Content Platform. Your solution for direct in-store reordering. Retailers can track real time stock availability of suppliers. Our app makes the endless aisle easily accessible. With Clara sales assistants can reorder out of stock products directly while talking to the customer. Here’s what the fashion industry thinks about FASHION CLOUD. In the face of the digitalization of the fashion industry, FASHION CLOUD constitutes an important support tool. The BTE (Federal Association of the German Textile Retail) strongly encourages suppliers to share their footage via this interface. 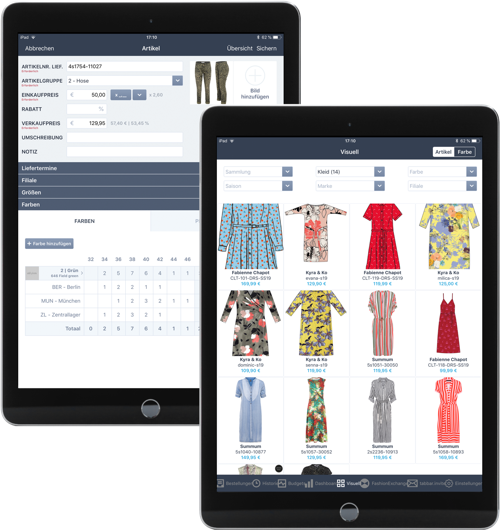 FASHION CLOUD reduces our workload significantly and saves us lot of time and money. The quick distribution of our marketing material and product data via one platform means our marketing team spends fewer resources on distributing our material to every single one of our different retailers individually. Integrating our ERP system with FASHION CLOUD has significantly improved our internal processes. Now, we have pictures of every single one of our products stored in our ERP system which provides us with much better insights into our own stock. Questions? Get in touch with our customer success team. We are taking the order process one step further: Following the endless aisle, which mainly focuses on POS out of stock situations and specific customer wishes, we will now also make the traditional reorder process available on our platform. Gerne erzählen wir dir mehr zur ORDER PLATTFORM.